When I talk to clients about paint colours and propose using a dark colour, invariably they worry that it will make the room feel smaller. Fear not, is my standard response, dark colours (especially cool colours, which are receding) make walls disappear and leave you with high impact drama. Many are skeptical, but when the first coat goes on, they are smitten kittens and I secretly turn and do a mini fist pump. Rooms that are particularly suited to darker hues are living rooms, dining rooms, bedrooms and my personal favourite, bathrooms. Many of us have small bathrooms with not much natural light, so instead of fighting nature, why not get into bed with it and create a wow room? This monochrome bathroom is dark, but the gorgeous tiled floor and white bath alcove break it up and create contrast. I also love that the ceiling has been painted black which is a trick I’ve used in my own bathroom. It creates a cocooning effect which I enjoy when I’m preparing to face the big bad world on a cold wintry morning. Now here’s a hotel bedroom I could happily move into. I suspect this deep inky navy is Hague Blue by Farrow and Ball. 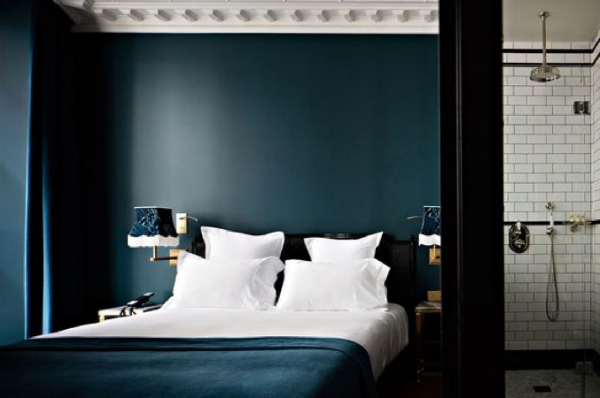 I love the tonal velvet curtains and notice how the brass light fittings really pop against blue. It doesn’t matter what your personal taste is, dark colours work well with any style, as proven here in this contemporary masculine living room. Are you sold yet? Before you head down to your local decorator’s merchants to buy your shady test pots, here are a few things to mix into your brain to ensure the greatest chance of success. I personally enjoy homes with contrast as you move through the spaces. For instance, I have two reception rooms, one dark and one light which we use for different purposes. You notice when you move from the light to the dark and your mood is instantly affected. Nothing looks more contemporary than painting everything out, walls, doors, windows, skirting, coving, hell, you can even paint the ceiling! Most of us have white skirting and windows which is a classic look, can feel a bit boxy if your room has multiple windows and doors (you lucky thing you). All colours look amazing against a dark backdrop. Go crazy with bright and neon accessories and soft furnishings or metallics which look especially breathtaking. Treat the dark as a neutral and don’t hold back. I put my money where my mouth is. This is a snapshot of a corner in my ‘grown-ups lounge’ (the one where we close the doors and hide all the kids’ plastic crap in the room next door and pretend we are a sophisticated). I digress. A bit of lush greenery against a sludgy background is a match made in heaven. And that’s it folks. Take the plunge and feel free share your results with me.